Posh players troop off the pitch after a poor performance at Oldham. Photo: Joe Dent/theposh.com. Peterborough United manager Grant McCann admitted he was ‘disgusted’ by his team’s performance at Oldham tonight (January 24). Posh completed a run of five away games on the bounce by losing a League One match 2-0 at Boundary Park to the team who started the night next-to-bottom of the table. Posh substitute Paul Taylor runs away from Ryan Flynn of Oldham. Photo: Joe Dent/theposh.com. McCann stated it was the worst he’d seen his side play in his time as manager. He insisted they performed better when they lost 5-1 at Bury 10 days ago. “At laest at Bury we kept going,” McCann said. “We didn’t fold that day, but we did tonight. “We were poor from the first minute to the last. We started the game badly and never improved. “That was the worst we’ve played under my management. I was disgusted by the performance. Posh full-back Michael Smith gets away from Oldham's Ollie Banks. Photo: Joe Dent/theposh.com. “We played with no energy and no tempo, and we created nothing. We had no combination play, there was no sharpness around their penalty area. Everything went wrong. “It wasn’t the plan to send 60-yard balls into their penalty area because they have two experienced centre backs who will deal with that all day. “I did consider changing the side, but we won at the weekend so I kept the same team and that’s something I now regret. “We are not even a footballing side at the moment, I don’t know what we are, but it’s my responsibility to sort it out and I will. “We have five of our next seven matches at home and we must try and win them all. “We keep getting ourselves in a good positions in he table, but then we don’t capitalise on it. It’s happened again tonight when we got what we deserved. Oldham were better than us. “It’s always games we expect to win that we mess up. This was never going to be easy as a big home crowd was guaranteed and they had a new manager who has had success here before. “We prepared the same as we would have done for Bolton and Sheffield United. 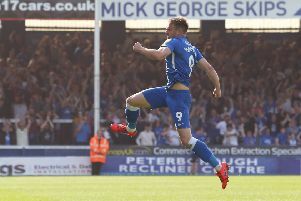 Posh remain eighth in League One, four points adrift of the play-offs, but they have now picked up one win from their last six matches, five of them against teams currently in the bottom eight. Posh host 16th-placed MK Dons on Saturday (January 28). It will be Posh’s first home game of January.